Nadia von Maltzahn is the deputy director of the Orient-Institut Beirut since April 2018. She is currently on maternity leave. 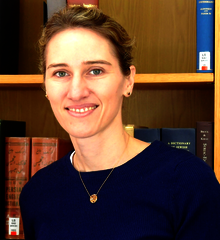 Nadia von Maltzahn has been deputy director of the OIB since April 2018, having joined the Institute as a research associate in 2013. She is the author of The Syria-Iran Axis. Cultural Diplomacy and International Relations in the Middle East (I.B. Tauris, 2013, 2015) and holds a DPhil and an MSt in Modern Middle Eastern Studies from St Antony's College, University of Oxford. She received her BA Honours in Middle Eastern and Islamic Studies from King’s College, Cambridge. Nadia co-edited The Art Salon in the Arab Region: Politics of Taste Making (Beiruter Texte und Studien 132, 2018), Divercities: Competing narratives and urban practices in Beirut, Cairo and Tehran (Orient-Institut Studies 3, 2015) and Inverted Worlds: Cultural motion in the Arab region (Orient-Institut Studies 2, 2013). In 2018, she acted as a reviewer for META Middle East Topics & Arguments. Her research interests include cultural policies, artistic practices and the circulation of knowledge. Her current research project at the OIB deals with cultural policies in Lebanon, looking in particular at cultural institutions and their role in the public sphere. (2013, 2015) The Syria-Iran Axis. Cultural Diplomacy and International Relations in the Middle East. London: I.B. Tauris. BTS 132 (2018) The Art Salon in the Arab Region: Politics of Taste Making. Nadia von Maltzahn and Monique Bellan (eds.). Beirut: Orient-Institut Beirut. OIS 2 (2013) Inverted Worlds: Cultural Motion in the Arab Region, Syrinx von Hees, Nadia von Maltzahn and Ines Weinrich (eds.). Guiding the Artist and the Public? The Salon d'Automne at Beirut's Sursock Museum. In The Art Salon in the Arab Region: Politics of Taste Making. Edited by Nadia von Maltzahn and Monique Bellan. Beirut: Orient-Institut Beirut, 2018, 253-280. Cultural Exchange Within and Across the Eastern Mediterranean. In Dialogue in the Med: Exploring Identity through Networks. Valletta: Fondation de Malte, 2015, 145-162.
with Rana Yazaji. Syrian Culture in Turbulent Times. In Another Europe. Amsterdam: European Cultural Foundation, 2015, 440-463. Governance of Culture in the Wake of the Arab Revolutions: Preliminary Observations on the Case of Egypt. In N. Belakhdar, I. Eickhof, A. el Khawaga, O. el Khawaga, A. Hamada, C. Harders and S. Sandri (eds. ), Arab Revolutions and Beyond: Change and Persistence. (Working Paper No.11, August 2014), 225-240. One Side of the Coin: The Official Sphere of Syrian-Iranian Cultural Relations. Orient II (2014), 12-15.
with Rana Yazaji. Syrian Culture in Turbulent Times. In Cultural policy and management Yearbook 2012-2013. Istanbul: Istanbul Bilgi University Press, 2014, 35-46. Kulturforschung: Die arabische Gruppe für Kulturpolitik. In itb infoservice, 6. Schwerpunktausgabe 05/13, 36-37. Iran’s Cultural Diplomacy. In H.E. Chehabi, C. Therme and F. Khosrokhavar (eds. ), Iran and the Challenges of the Twenty-First Century. (Costa Mesa, CA: Mazda, 2013). The Case of Iranian Cultural Diplomacy in Syria. Middle East Journal of Culture and Communication 2 (2009), 1-18. Reviews. Iranian Studies, 42:2 (2009), 347-352. Book review of Syria and Iran. Diplomatic Alliance and Power Politics in the Middle East by J. Goodarzi.